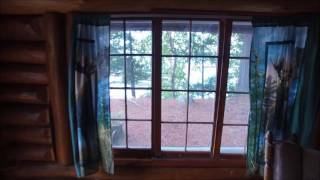 Our Resort Cabin #2 - Journey’s End, is a full log, one-bedroom cabin located lakeside. You’ll feel you’ve stepped back in time in this authentic Northwood Minnesota cabin in Orr, MN. Imagine going out on the lake for a fantastic day of fishing on Pelican Lake and returning home to this “Angler’s Special.” The picnic table is a great place to relax and watch the sunsets while you cook up your fresh catch of the day on your own BBQ grill, or stack up a pile of wood in the fire-ring for a night time bonfire. Wood is available for sale. Sip your morning coffee in the lakeside swing and enjoy the relaxing views of water and forest. Head down to the sandy beach for a swim or cast off the convenient 450’ fishing pier if you want to keep your angling simple. The resort has a fish cleaning station and has its own boat rentals for a relaxing, effortless fishing getaway.. You can also bring your own boat and launch it at the free ramp. There is a small fee to dock at the 500’ resort dock. We have a freezer service for all those extra walleye, bass, northern pike, and pan fish to take home as a reminder of a perfect vacation. The cabin accommodates up to four people with two double beds and a half bath without a shower. Guests can bathe in the shower building or sauna building.The cabin includes a TV/DVD and free WIFI. The efficiency kitchen with all pots, pans, silverware, utensils and dining table is a compact but efficient area to cook up your favorite meals. Linens are included, but remember to bring extra towels, beach towels, soaps, coolers, blankets and warm clothes. Sleeping arrangements: Bedroom 1 - double bed; living area - double bed. The Cabin O’Pines Resort is outfitted for endless fun. There is a sandy swimming beach, fishing pier, pool table, half basketball court, horseshoes, pedal bikes, paddle boards, kayaks, canoes, 80-foot zip line, and wood-burning sauna for all your recreational adventures. Families with children will also appreciate the 12-activity playground, ladder golf, tether ball, small library, boards and games, and Nintendo games. These are all available for your family entertainment. Guest can use the small laundromat on site to wash clothes. Firewood, gas, snacks, ice, gifts, and live bait are all for sale. We have pontoon boats and fishing boat rentals with 4-stroke Mercury outboards to find those fishing “hot spots” on the lake. Gather up your fresh catch and clean them in style at the resort’s fish cleaning station, go for a swim, and take a nice rest in the sauna. Doesn’t that sound like an exceptional day? You can experience that and a lot more at this Minnesota resort on Pelican Lake. There is abundant outdoor recreation right at the resort; but if you like to golf, be sure and pack your golfing gear. The nearby Mesabi Country Club with 18-holes in Hibbing is just a short drive away. The greens wind through the beautiful Northwoods terrain filled with Aspen, Birch and ancient White Pines. The Giants Ridge and The Wilderness at Fortune Drive golf courses are also nearby. After an invigorating golf game, you just might want to cast your line from the 450’ fishing pier afterwards back at the resort or sunbathe on the beach. If you’ve never seen a black bear, here’s your chance. The Vince Shute Wildlife Sanctuary, operated by the American Bear Association, is located just a few miles down the road. The sanctuary is open from 5:00 pm-8:00 pm Tuesday-Sunday. This special sanctuary is considered one of the best places to see wild black bears in a natural habitat. It’s really a sight worth seeing free-roaming bears in wooded areas from the open viewing deck.